Kentai's Films: Toshiba vs Lite-On: Round 1, FIGHT!! Toshiba vs Lite-On: Round 1, FIGHT!! On this shot, you can see that both recording setups - the Lite-On via composite, and the Toshiba D-KR10 via S-video - have their own strengths and weaknesses. The Toshiba looks more washed out and noisy, but the Lite-On has more rainbows and signal distortions, like bleeding from the outlines. The Toshiba recording has constant dot-crawl on edges, but the Lite-on has dot-crawl in random areas and smears out others. The Lite-On has more banding, but the Toshiba has more mosquito noise. 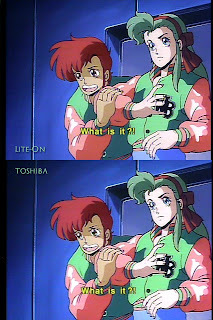 As far as "still" images go, the recording quality is almost a toss-up, with the Toshiba winning solely because it looks slightly more like the source LD. Neither is exactly a looker thanks to the ancient LD transfer we're dealing with. But this is all meaningless if the "new" recordings have that temporal dot-crawl problem that plagues the otherwise somewhat respectable Lite-On recorder. So, did spending all that cash fix the evil bug that put my entire LD/VHS capture pyramid scheme on hiatus? Check the boots, especially. They're virtually transparent in the Lite-On shot because of how poorly its' internal comb filter tried to "fix" the ghosting chroma. And, yeah, you can see the rope through the boot tops even on the original LD, so much as I wish I could, I can't blame everything under the sun on the deck doing the recording. 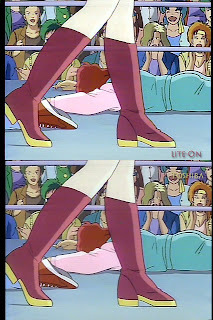 I'm not certain who it was that coined the phrase "garbage in, garbage out", but I swear that there's never been a truer adage in terms of consumer level video restoration. This shot looks better in every way imaginable on the Toshiba recording: solid color, less noise, less rainbowing, and no friggin' temporal dot crawl!!! Sure, the gains may seem minor when all I'm throwing at it are frame-blended, noise covered, poorly mastered anime LDs from the mid 1980s, but the minor issues that come with the new territory - such as increased noise, and wonky levels - are things that I can fix in post. There is a certain level of irony in that, just the other day, a guy up on the ADC uploaded this very same title. But there's one thing I know for a fact his copy does not have, and it's a doozy: Linear PCM audio. That delicious, uncompressed CD quality audio that 95% of DVDs on the planet don't support because the space demands are so immense that you could fit four Dolby 5.1 tracks in the space required for a single 2.0 PCM track. The new Toshiba has it, and while I don't have any samples to show off just yet, I can promise you that going from 256kbps compressed Dolby Digital to 1536kbps is pretty goddamn sweet. P.S. - This is really my 200th blog post?! Jesus Christ... I really don't have a life outside of OCD obsessions, do I? *Shrug* I can live with that. "Poor us, poor us... poor everybody else!"